Kanye West is undoubtedly one of the most unapologetically honest rappers to ever pick up a microphone. He knows what he is and what he’s doing and as such, produces some of the most self-aware and truthful music in the industry. My Beautiful Dark Twisted Fantasy is the penultimate Kanye album in a long line of already highly competent albums and one of the best albums of 2010. This is the ultimate realization of the themes that have shaped his music career. 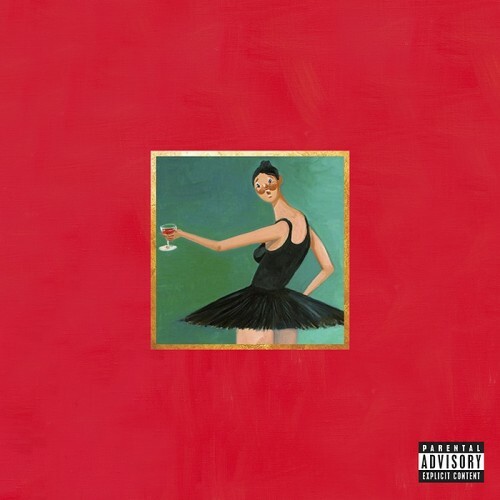 Materialism, rejection, love, loss and sadness, MBDTF has a very dark overtone about it and the more you listen to it, the more you begin to feel as though you’re delving further and further into West’s subconscious. Similar to 808s and Heartbreak, Kanye lets it all hang out. He’s unrelenting, unconcentrated and strangely focused. Like an expert sniper, he zeroes in on his target and strikes with precision. There’s no nonsense, just an unfiltered display of raw emotion. Lyrically, this is Kanye’s strongest and most consistent work yet. Where he showed glimpses of greatness on the track Gone from his second album, Late Registration, he now seems capable of replicating that level of lyricism across an entire album. The level of depth and complexity in his rhymes has exceeded that of any other album he’s released so far. Kanye’s greatest asset in my eyes is how self-aware he is and it shows in his rhymes, such as in the song Gorgeous in which he says “I’ll choke the South Park writers with a fish stick”. This line sounds appropriately cathartic within the tone of the song itself. Guest appearances are also excellent, demonstrated best on the feature heavy tracks Monster and So Appalled. Jay-Z is as lyrically potent as one would expect from such a veteran in the industry but it is Nicki Minaj that surprised me most on her verse on Monster. She outshines both West and even the venerable Jay-Z in her performances, playing with many differing lyrical and vocal styles in her just over a minute long verse. I was very impressed and I saw for the first time why she has been surrounded with such a great amount of hype in her short career. In terms of cohesion, this is one of the most well put together album I’ve heard in years, second, at least recently, to Janelle Monae’s The ArchAndroid. Each track flows logically from one song into the next. Layered perfectly, building on the foundation of the song before it but still sounding fresh. The album’s title almost perfectly reflects the music contained within it as you really get a sense that this has come from the darkest recesses of Kanye’s subconscious and is reflected in not only his and his guest’s lyricism but the production behind it. My Beautiful Dark Twisted Fantasy is an amazing album that really comes together in every way. It’s the most consistently brilliant, cohesive and lyrically impressive album Kanye West has released since 2005’s Late Registration and is easily one of the best albums released in a year that was already quite good for great album releases. It remains to be seen whether or not Kanye West can top himself with his next album going forward but based on what he has done here, he seems perfectly capable of pulling it off.